Smart ways you can start reducing energy and improving your business's bottom line. account for half of the total energy usage. But, by applying these 5 tips you can cut your energy consumption and keep a little more cash in your pocket. 1. Install an auto door closer. When rushing around a commercial kitchen, checking to make sure the walk in freezer or cooler door is latched shut is the last thing on your mind. Auto door closers ensure the refrigerator/freezer doors are completely closed. Not only does this help prevent food from spoiling, but also keeps that cold air from spilling out. 2. Install strip curtains. Every time the walk in cooler door is opened, a rush of cold air floods out, and air from the outside world infiltrates in. Strip curtains create an extra barrier that will help keep that cold air in, and the warmer exterior air out. Estimates put strip curtains effectiveness rate at 65%. 3. Upgrade to EC motors. EC motors can be up to 70% more efficient than old motors. To learn more on how they work check out our blog, “What is an ECM Type Motor"
4. Switch to LED lights. LED lights are some of the most energy efficient products on the market. 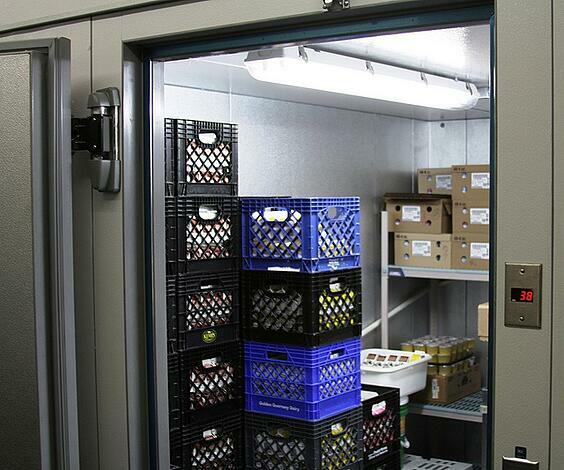 LED lights also thrive in cold conditions, making them a perfect fit for refrigeration. 5. Utilize night covers. Open display cases drain energy, and should be covered when not in use. Utilizing night covers keeps the cold air contained, which means the motors will not have to run at full capacity when the establishment is closed. Want to find more easy ways to increase your energy efficiency savings for your business? Download our free checklist today to get started. Next Do You Need a Ballast for LED Lights?